Stealthy Mom: Ding! Ding! Ding! For those in need, the holiday season can be particularly difficult. We do not all have cozy homes and well-stocked pantries. Some people face living on the street without a warm coat or cannot afford to heat their home. Many wonder where and when their next meal will be. The Salvation Army offers shelter and a hot dinner for the homeless on the coldest of nights. All year long they provide disaster relief, counseling, youth camps, temporary lodging and outreach services for the elderly. At Christmas time, clothing, dinners, and toys are distributed to families in need. 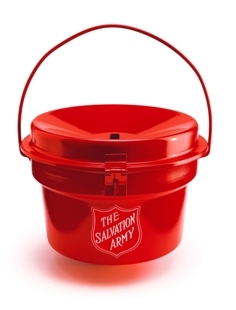 Red Kettles are a familiar sight this time of year, and are an essential fund raising tool for the Salvation Army. Instead of looking for a sitter so I could ring a bell outside the local grocery store, I took my kettle online. Ding! Ding! Ding! To make a donation to the Salvation Army online, click here.